The Kawasaki KZ1300A is a motorcycle produced by Kawasaki from 1979 to 1982. At the end of the Seventies, Kawasaki was riding high. 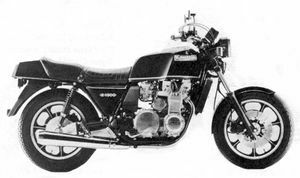 Several of its models had proved a fantastic success, from the 900cc Z1 to its three-cylinder two-strokes ranging from the 250cc S1 to 750cc H2. The marque had carved itself a solid sporting image, crowned in 1978 by the 250 and 350cc world championships. More crowded than ever, that year the range consisted of no Fewer than 16 models -including three 1000cc machines! 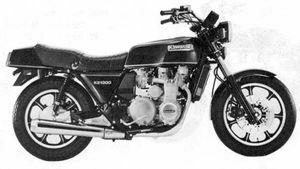 The time could not have been better to make a grand gesture, and Kawasaki seized the moment by launching its flagship KZ1300 at the Cologne Show in 1978. 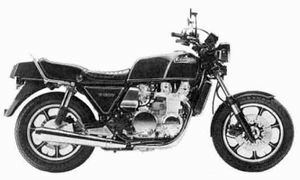 Deisgned to be the successor to the 900cc Z1, the KZ1300 took the concept of motorcycle size beyond previous boundaries and while it seemed almost excessive, it was ahead of its time. But its luck ran out. 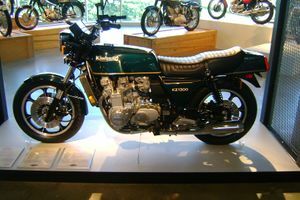 Kawasaki, who had been beaten to the draw by Honda with the launch in 1969 of the first Japanese 750cc four cylinder, suffered the same mischance in 1978, when the Honda CBX1000 six-cylinder appeared at the beginning of the year, leaving Kawasaki holding only the honor of making the largest-capacity machine in that period of burgeoning technology. Even so, Kawasaki could justifiably be proud of having made the most impressive two wheeler, though it proved a bit over the top for Europe, which only gave a half-hearted welcome to this very efficient(in terms of sheer performance) six-cylinder, which seemed too heavy and insufficiently sporting. 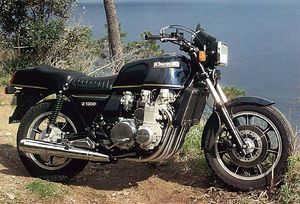 In America, too, early enthusiasm faded away and the KZ1300 failed to make its mark, for the US market seems indissolubly wedded to the big V-twin. 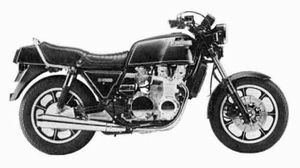 The Z1300 was produced until 1989, where it had gained among other improvements, digital fuel injection and a second 200 watt alternator. Don Vesco's World Speed record streamliner was propelled by two turbo charged KZ1300 motors. Major Changes: Adjustable air rear shock absorber, transistorized ignition system with electric advancer. Remarks: 6 cylinder, liquid-cooled engine, shaft drive, cast wheels, front and rear disc brakes. This page was last edited on 27 November 2010, at 22:23.